In an open letter Thursday (Dec. 8), a prominent Russian scientist lamented the failure of the country's Phobos-Grunt spacecraft, which was meant to collect samples from Mars' moon Phobos, but instead is languishing in Earth orbit. "We are deeply sorry about the failure" of Phobos-Grunt, wrote Lev Zelenyi, director of the Space Research Institute and Chair of the Russian Academy of Sciences' Solar System Exploration Board, in a letter to fellow scientists and mission team members. "We hope in [the] future to continue our collaboration on space science projects." The troubled spacecraft has been stranded since its Nov. 8 launch, when it failed to propel itself off into a deep space trajectory toward Mars. "However, despite people being at work 24/7 since the launch, all these attempts have not yield[ed] any satisfactory results," Zelenyi said. "Lavochkin Association specialists will continue their attempts to establish connection with the spacecraft and send commands until the very end of its existence." Russia's NPO Lavochkin was the main contractor of the Phobos-Grunt project. The spacecraft is expected to enter Earth's atmosphere in early January as a piece of space debris. 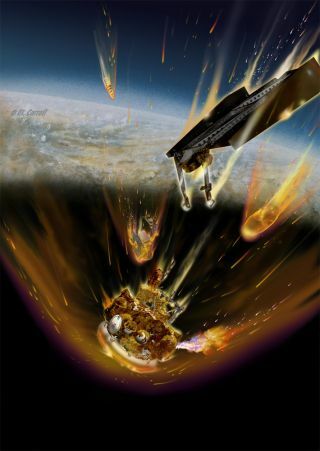 Zelenyi explained that Russian space experts are now working on the issue of re-entry and the "probability of where and which fragments may hit the ground (if any)," he said. The Russian space scientist did note that there is "a sensitive matter" regarding the vehicle's re-entry: one of the scientific instruments onboard Phobos-Grunt does contain radioactive material, Cobalt-57. However, Zelenyi said the amount of this material is less than 10 micrograms, and according to evaluations, should pose no significant problems. Looking into the future, Zelenyi highlighted in the letter the next steps of the Russian space science agenda. Current plans, he said, call for robotic moon missions called Luna-Glob and Lunar-Resource, and discussions between Russia, ESA and NASA are under way regarding collaboration on the ExoMars and Russian Mars-NET missions to the Red Planet. "Moreover, the Russian Academy of Sciences would like to prepare a new mission to Phobos," Zelenyi said, but no decision has yet been made on this undertaking.